THE LONGER YOU STAY THE MORE YOU SAVE!! Discounts are automatically applied when entering your dates online. 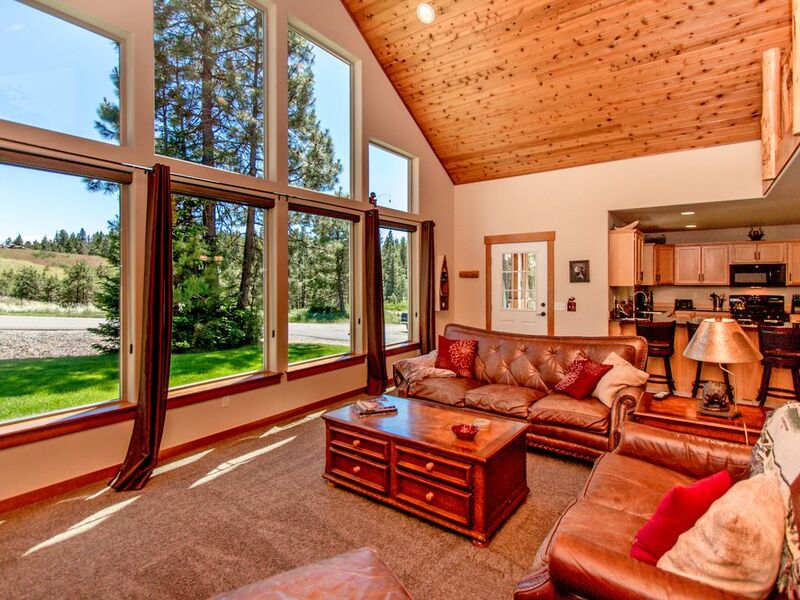 Exceptional cabin and location in sought after Roslyn Ridge near Lake Cle Elum. Centrally located between Lake Cle Elum and Roslyn. Just minutes to the lake, trails or Golf at Suncadia Resort. Snowmobile, bike or hike into miles of maintained trails from your backyard. Fully equipped with WiFi, Air Conditioning and Dish Network! Great backyard with a large grass area, picnic table, and fire pit. This spectacular cabin has granite counter tops, tile and slate floors, WiFi Internet, Keurig Coffee Maker, and comfortable leather furniture! The Great Room features a Flatscreen TV w/Dish Satellite/DVD, and a floor to ceiling River Rock Gas Fireplace. The cabin sleeps 8 comfortably in beds. The upstairs Master has a King Bed and a private bathroom, the 1st Bedroom on main floor has a King Bed and the 2nd Bedroom as a Twin over a Double Bunk Bed. You'll also find a Twin Bed in the cozy loft. There's a second full bathroom on the main floor. You won't find a more inviting and relaxing venue! During the Winter you may snowmobile directly from the cabin to over 100 miles of groomed snowmobile trails with big views of the Cascade Mountains. Entrance to the Roslyn Ridge Activity Center is $7.50 person per day. The entrance fee is charged at the door (cash only). The Roslyn Ridge Activity Center is open between Memorial Day Weekend and Labor Day Weekend. It is also open on the two weekends following Labor Day. Home was very comfortable for our group of 4 adults and 2 kids. Communication was good and there were no issues during our stay. There is a huge sledding hill right across the street from the house which was great. Thank you for staying with us at Elk Ridge Chalet, we appreciate it. Elk Ridge Chalet is a great home and we are so glad to hear that you all enjoyed your stay and the surrounding area. Thank you for the 5-star review too and please let us know if you have any questions. Great cabin in a great location! We enjoyed every aspect of our stay. Cabin was clean, comfortable and cozy. We love the area! We will be back. We are glad to hear that you enjoyed your stay at Elk Ridge Chalet. You were great guests. Please let us know if we may be of any future assistance for you! Perfect cozy house with great access to sledding and snowmobiling! We would definitely book this place again! Elk Ridge Chalet - Last vacation before school starts! Access to the Swimming Pool Facility at Roslyn Ridge! Open during the summer season only. Great sledding hill right across the street from the cabin! The nightly rates above do not include potential extra guest fees at $15p.p. per night, the departure cleaning fee, damage deposit/waiver, or WA State Taxes.